Adolescent obesity poses a public health risk and, as of 2012, more than 20 percent of teenagers were obese, according to the Centers for Disease Control and Prevention. However, some teenage girls may suffer from body image problems and believe they are overweight, even if they're not. Your body mass index can give you a good idea as to whether you're at a healthy weight, but it may not accurately estimate body fat in some people. A doctor can advise you as to whether or not you have a healthy body fat percentage. Carrying excess body fat can have a number of adverse effects and may change your overall quality of life. Not only does it put you at an increased risk for cancer, stroke, heart disease and diabetes, it can also interfere with your sleep and breathing and cause you to have less energy. Being overweight may bring on joint problems such as arthritis. These issues can make it difficult for you to participate in all the activities that other people your age are enjoying. Typically, young children have a body fat percentage of about 18 percent, regardless of their gender. As girls go through puberty, their body fat usually increases by 8 to 10 percent as a result of normal development. A healthy body fat percentage for females is between 17 and 32 percent, with anything over 32 percent being too high, even if you're within a healthy weight range. It's possible to have a normal weight but a high body fat percentage, which is called normal weight obesity. Being "skinny fat" has many of the same health consequences as being overweight, including an increased risk of heart disease and type 2 diabetes. Teen-aged girls develop at different rates, as some enter puberty later than others and some may develop more slowly than others, so some girls might have somewhat different body fat percentages or look different from other teen girls, even at the same age, height and weight. Many girls are unhappy with their bodies, even when they're a healthy size. For example, 85 percent of normal weight girls were taking steps to control their weight and 29 percent of these girls suffered from body image distortion -- thinking they were overweight, even though they weren't -- according to a study published in the Journal of Adolescent Health in 2010. If you are worried about your weight or body fat percentage, check with your doctor to see whether there is an issue or if you are within the normal range for a girl your age. The most accurate ways to measure body fat are quite expensive and usually are available only with a doctor's prescription. You can use skinfold calipers to measure fat under your skin, but they require a trained professional to get accurate measurements. Some health clubs also have hand-held bioelectrical impedance analysis machines, also called BIA machines, and scales exist that use this method to measure body fat, but these versions aren't as accurate as the professional versions hospitals use. BIA involves sending a painless electrical signal through your body. The time it takes the signal to pass from one side of your body to the other can be used to estimate body fat, because how long it takes the signal to go through fat differs from how long it takes the signal to go through muscle. However, if you are over hydrated or dehydrated, BIA can be inaccurate. Other potentially more accurate methods include underwater weighing, a dual-energy x-ray absorptiometry scan, or sitting in a capsule called the BodPod, which calculates body fat by measuring how much air you displace. 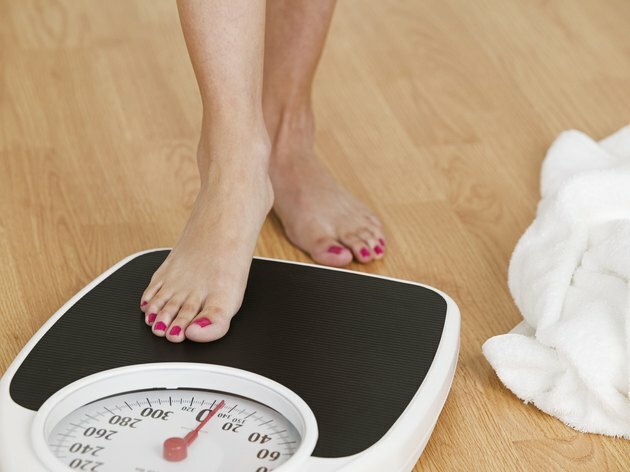 TeensHealth: What's the Right Weight for My Height? UCSB: What Is an Acceptable Body Fat Range for Teenage Boys and Girls That Is Not Likely to Lead to Health Problems Later on in Life?